This huge 4x6m Marquee tent features a huge opportunity for promoting your brand and information in a stylish and effective way. Take advantage of our printing process which allows for full colour CMYK digital printing - meaning you can print whatever you want, wherever you like, on every surface. With a huge pool of options to choose from, such as extra walls, half walls and zippered entry, you can customize your Marquee to suit your event perfectly. In the interest of our clients, and the quality product that we endeavour to provide we only offer heavy duty, commercial quality frames. Manufactured from hexagonal aluminium section. 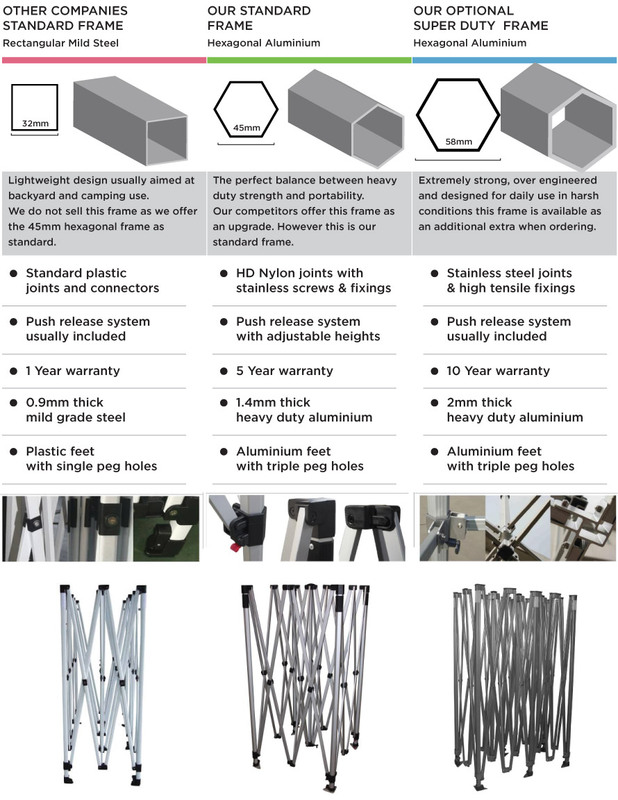 These are designed to stand up to rugged daily use in any commercial or trade show environment. By stocking only superior level frames we are also able to provide a complete range of replacement parts in case your marquee becomes damaged.